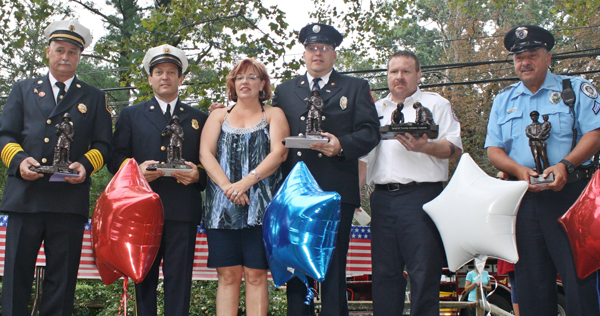 Wyndmoor Fire Co. Chief Fran DePaul, Oreland Deputy Chief Don Serianni, Community Day Organizer Teresa Buzniak, Flourtown Fire Company, President, Tim Ernst and Deputy Chief Springfield Ambulance Jerry Edwards and Police Corporal Ray Vesci with the awards presented by the Community to honor the emergency responders of Springfield Township. On the Tenth Anniversary of the horrific attacks on the our nation on 9/11/01, the community of Springfield Township gather to remember all those who lost their lives in NYC, at the Pentagon and in Shanksville, PA. Flourtown Fire Company along with the other two township fire companies, Oreland Volunteer Fire Company and Wyndmoor Hose Company, Springfield Ambulance and Springfield Township Police Department were also honored as our local emergency responders. The public enjoyed free food, and information from many community organizations as they have for the last 17 years in beautiful Cisco Park in Erdenheim, PA.